One of new challenges taken by the HAPPO-EN which will celebrate the 75th anniversary of establishment as a life-long ceremonial venue is its organic life restaurant, ANNIVERSARY GARDEN. Its concept was renewed in March 2017. 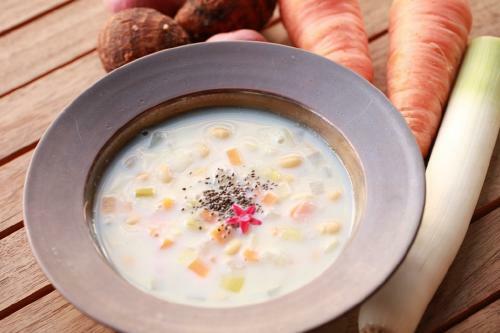 They have strict rules for themselves which are the use of naturally grown products and no use of 7 allergens (egg, wheat, milk, crustacean, shellfish, buckwheat, nuts). With those restrictions, how they can produce tasteful and beautiful dishes? 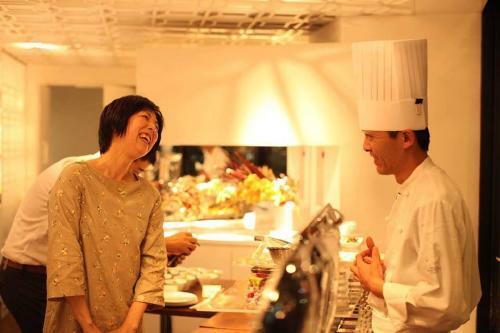 We had an interview with the chef, Mr.Taiyo Kakisako and the manager, Mr.Oyama. Click here for location and detailed information on ANNIVERSARY GARDEN. 1 Reason for the drastic change on the menu. 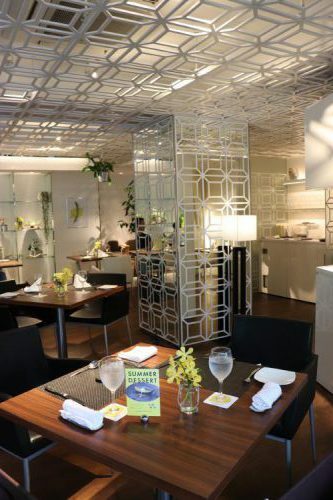 Why did the long-established restaurant go for 7 allergen-free menus with naturally grown products? Reason for the drastic change on the menu. 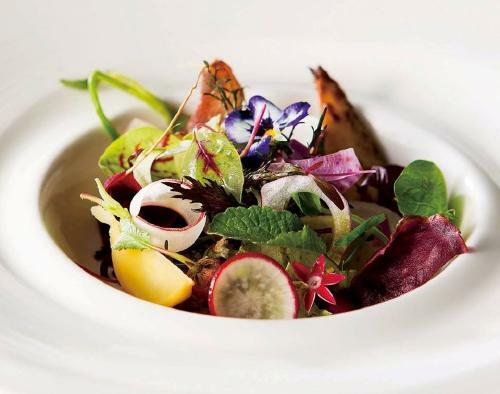 Why did the long-established restaurant go for 7 allergen-free menus with naturally grown products? 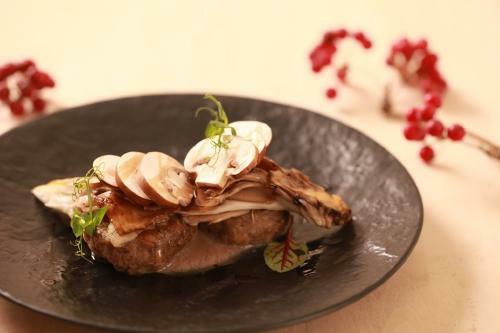 An organic life restaurant in Shiroganedai, Minato Ward, ANNIVERSARY GARDEN is operated by famous restaurant and wedding venue with about 40,000 square meter garden, HAPPO-EN. ANNIVERSARY GARDEN which had originally been used only for wedding parties and events of companies was open to the public 2 years ago. ANNIVERSARY GARDEN was established and named to celebrate the anniversary of those who had wedding ceremony at the HAPPO-EN. The HAPPO-EN claim themselves as a life-long ceremonial venue not just for couples’ wedding ceremony but also for celebrating the anniversary for the rest of their life. After the renewal, they began to think how to support further their customers through food while receiving general customers. Mr. Oyama (the manager): People can cerebrate an anniversary once a year. We want them to repeatedly spend their anniversary here for the rest of their life. To make it happen, it is important for them to enjoy long and healthy life. We thought we should support them to be healthy with healthy diet. It was March last year when they decided to drastically change their concept. 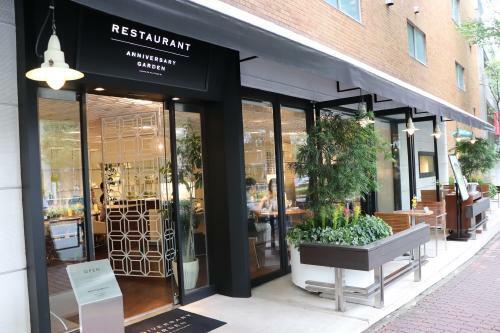 It renewed the restaurant to serve 7 allergen-free food prepared with naturally grown vegetables and organic products and to support their customer’s health. Focusing on safe and reliable ingredients. we use the ingredients produced with naturally grown vegetables and plants and the organic ingredients meeting the Organic JAS Standards. We don’t use preservatives, colorants and the ingredients containing chemical substances. We don’t use refined white sugar and we use natural sweetener. We don’t use refined salt and we use sun-dried salt. We don’t use any ingredients containing margarine, shortening and trans-fatty acid. Off course, their menus are adaptable to vegan. 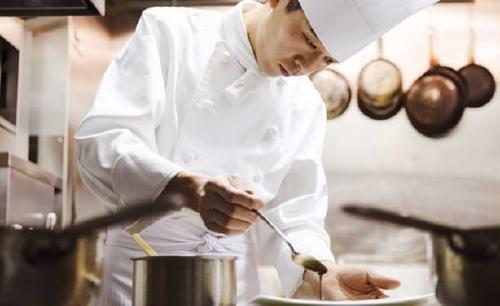 Only a very few luxurious restaurants in Japan can offer the same service. Their menus are changed every month. During the lunch time, we can enjoy vegetables in season with salad, open sandwich and curries. 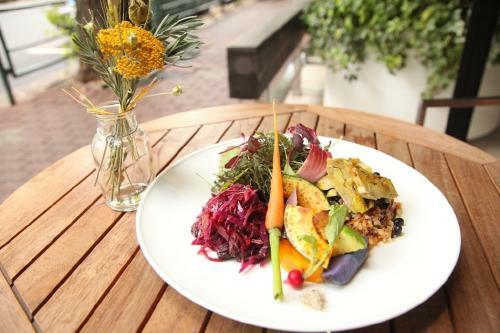 We can taste grilled vegetables and special dish prepared with vegetables from their contract farm, SHOFARM in Yokosuka with the GARDEN PLATE Lunch (2,100 yen excluding tax and service). 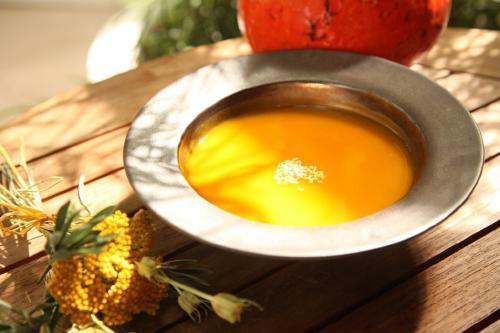 Seasonal soup with which we can fully taste the ingredients comes with the lunch menus. 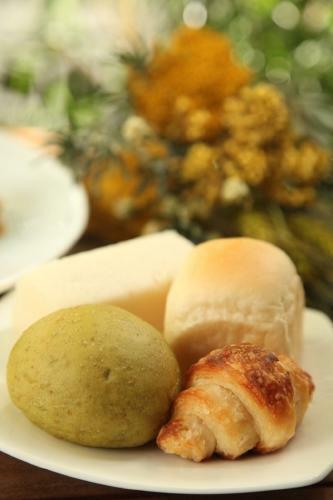 Very soft rice flour bread is baked at the Bakery BLUE TREE in the main building of HAPPO-EN. The staff of ANNIVERSARY GARDEN visit producers and check products. The chef, Mr.Kakisako magically brings out the taste of vegetables delivered from producers around Japan. Mr.Kakisako never wastes ingredients. He usually uses skins for garnish and making broths. We asked Mr.Kakisako about his attitude about his work and his thought about 7 allergen free menus prepared with naturally grown products. Creating the recipes of ANNIVERSARY GARDEN must be very challenging for you. Mr.Kakisako: I instantly thought I could make 7 allergen free recipes when I was asked! But it was not that easy at the beginning. Since the way of serving the main dish was changed, I have created recipe variations per ingredient such as carrot. My cooking style has also been changed. In the past I made sauces using red wine, broth and butter. But now I make sauce using only vegetables even without alcohol. This is the biggest change. When I found well suited alternative ingredients to realize everyone’s favorite dish without butter and egg, I felt joy and contentment. What kind of twist do you use in your cooking method? Mr.Kakisako: I use several heating methods these days. I thought that naturally grown vegetables might need longer cooking hours to make the most of the taste compared to practically grown vegetables. So, I roast them. Also, I use rice flour crumbs to have more variations on the texture. This dish was created by his trial and error. 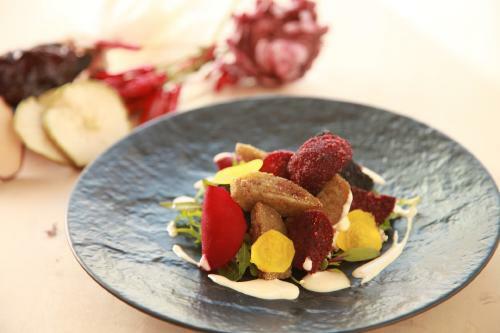 To slowly cook red, yellow and white beets, roast them for long hours and then deep-fry to bring out the sweetness. Then coat them with 3 color brown rice flour crumbs mixed respectively with black (bamboo charcoal), red (skin of beet) and green (moringa) powders to fry one more time. Cut it with knife, everyone will be surprised! Black fritter has red beet inside, red one has yellow beet and green one has white beet. The coated color does not match the inside. They are playful fritters created by the witty chef. Mr.Kakisako enjoys his challenges to discover new cooking methods and ingredients as a professional. 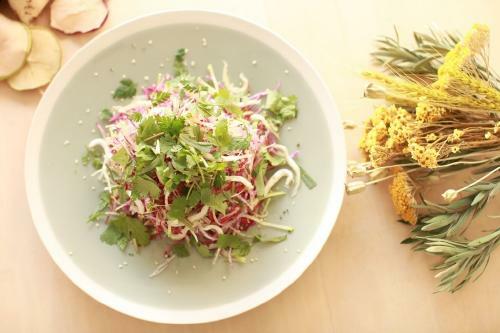 Since he knew the advantage of each ingredient, he can create both delicate and powerful dishes.